A stencil is a thin sheet of pasteboard, parchment or metal, in which outlines and general forms of the figures are cut out, for the purpose of being stencilled on cardboard or paper. By passing a brush charged with colour over the stencil, the colour enters the cut-out lines and imparts the figure to the material beneath. The pips, or common cards, require only one colour, either red or black, but the têtes, or court cards, require many colours. 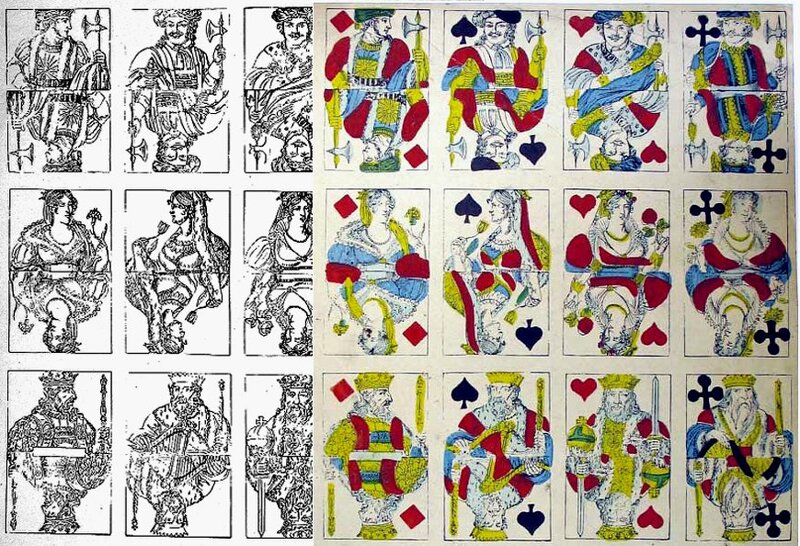 Right: Jack of Clubs from a pack manufactured by Reynolds & Sons, London, c.1851, in which the colours have been applied by brush and stencil. Especially in the dark blue areas, the brush marks are clearly visible, and in some places the colour has run outside its proper area. The stenciller places the stencil plate upon one of the white cardboards (which may already have the outlines printed on it), rolled and polished, and holding it steady with his fingers, rubs in the colour with a large, heavy, circular brush with closely set bristles. The brush is worked upon the stencil with a rotary dabbing sort of motion, until the forms are properly painted upon the card. For court cards, several-stencil plates are used, one for each colour. Suppose the ground colour to be red. 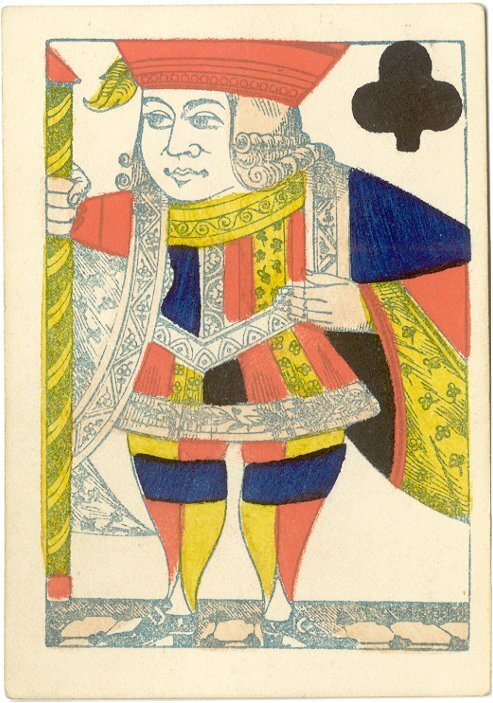 This goes over the cuffs, and belt, and coronet, and breeches of the knave; a stencil is then applied, which covers all parts of the card except those which are to be painted yellow: in this stencil, therefore, the cut-out parts fall on the figure exactly where the yellow is to be produced, and this represents the gold lace, the jacket, &c. ; a stencil is then applied, to allow the application of the light brown which serves for the flesh colour; then another stencil for the dark brown that colours the hair: then there is a stencil for applying the light blue which forms orders of courtly dignities, baldrics, and shoe strings. In this way the cardboards being covered with sets of cards are then cut up with such celerity that a skillful workman can in two hours and a half cut up 200 packs, of 52 cards each, or 10,400 cards. Stencilling can usually be detected by observing the outlines of the coloured areas which are often irregular with brush strokes discernible in the coloured areas. Operators using stencils were usually required to work at speed, hence the ink would often spill into the adjacent white areas. In some instances the stencilling appears to have been performed in a slovenly manner. Above: uncoloured and stencil-coloured uncut sheets of the Hamburg pattern by Dieudonné (France), c.1850. In the coloured version, successive stencil colourings of pale blue, blue, yellow, red and black have been applied. The Hamburg pattern is based on the Paris pattern and was used in Germany and Scandinavia. See also: Rotxotxo Workshop Inventories, Barcelona Make your own Playing Cards Manufacture of Cardboard Design of Playing Cards Letterpress Printing Chromolithography Amos Whitney's Factory Inventory Manufacture of Playing Cards, 1825.